Pours a clear straw yellow, bone white crackling head forms and some lace on the glass. Aroma is grassy, light pine and some bready malts. In the flavor, biscuity malt and a complimentary earthy hop bitterness. Crisp, clean, good hop presence and goes down all too easily. Would most certainly compliment a Fathead's sandwich. A: Pours a hazy yet bright yellowish golden color with a thick one finger foam head and some spotty lacing. S: Average scent on the nose. There are some undertones of noble hops, mostly grassy and citrys scents. There is a mild undertone off white bread as well. M: Very light crisp and refreshing. A nice lighted bodied beer with excellent carbonation. O: This is a great beer for a summer day. Ample amount of hops, but not overpowering that are balanced by the saltine cracker taste. This beer is crisp clean and quite refreshing. Pale straw color with a tall but whispy white head. Pretty standard for the style. Cracker and grainy malts with a hefty dose of cut grass. A hoppy pils it is... Grassy with a little spice on the finish. Delicate cracker and grains for the malt. Crisp and clean body. Very light. It's a good summer beer. Overall, and enjoyable hoppy pils and a vet good representation of the style. Pours a clear golden color with a bright white one finger head which gives way to some lacing up and down the glass. The aroma is of noble hops, earthy and crisp as well as a little bit of crackers present. The taste is earthy noble hops up front for a nice crisp bite, and is balanced out by the taste of crackers and pilsner malt and a hint of citrus to balance things out. The mouthfeel is very carbonated and medium bodied. The drinkability is good, for a pilsner there is a nice balanced flavor. This is a fairly easy drink, the slight tartness in the middle might be a little harsh to keep you from drinking a lot but it is a solid beer. Gudenhoppy Pils brewed by Fat Heads Brewery & Saloon, with an ABV 5.30% This brew pours out a nice amber color with a small white head. The smell is rich with grains and hops. You also pick up on a hit of sweetness in the smell of this brew. Now for the taste, it is bold with hops but this brew has a clean finish. The mouthfeel is bold at first with a clean finish. Fat Haeds did a nice job with this brew. Overall I'm giving Gudenhoppy Pils a 3.5 out of 5. On tap @ Fat Heads. Gudenhoppy Pils is unfiltered with great head retention and amazing lace. Golden straw color. A very nice looking German pilsner. The nose is made up of nice Pilsen malt with some noble hops. In particular, Perle and Hallertauer bring their herbal and slightly spicy signatures and make a splash while still remaining well within in style guidelines. They add just a touch of lemon and citrus to the mix. Pilsen malt gives a nice base with some sweetness and serves as a vehicle for the noble hops to showcase earthy and mildly tart notes. Slight graininess and malt reminiscent of unsalted crackers. A touch of lemon and grass from the hops. This beer is creamier than anticipated - I'm not sure if it's just due to low carb, but the body seems more medium than light. That being said, it's easy to drink. Overall, this is a good beer but not as refreshing as other Pilsner or Lager offerings from Fat Heads. If you enjoy Pilsners, seek this out. 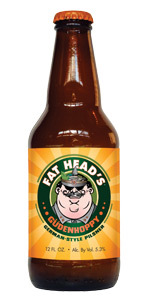 If you're more of an extreme beer guy, there are many more adventurous and rewarding beers at Fat Heads for you. Decent nonetheless. Truly gold in color with a beautiful-looking dimpled head. It sits about an inch thick and doesn't budge. Dry tinny cracker malts, light lemoniness, and citrus hop delight. Hint of tart tropical fruits. Woah! Super crisp with a lovely lemony twist. Staunchly bitter with rigorous leaf hop presence. Slightly minty in its bitterness. Never steers into acridity. Clean dry finish with some lingering lemon zest, pith, and near-metallic bitterness. Great sudsy feel. Big mouthful of bubbles. Body is appropriately on the light side. So quenching. Near perfect Keller Pils. 12oz bottle into a pilsner glass. The brew appears a hazed golden yellow color with a rich 3 finger white head. The cap slowly fades leaving a full curtain of lace sticking to the glass. A swirl effortlessly revives a finger back to the surface. The aroma is grassy and herbal with a zesty noble kick that is somewhat lemony. A dry bready grain inclusion comes in across the back as it warns with a soft touch of fruity alcohol. As it warms, a swirl releases some sulfur and cheese to footy grain aspect. The flavor is dry with plenty of zesty and pithy hop bitterness. Quite herbal to grassy with a grain backing that is fresh tasting but without any residual sweetness. Almost a lemony rind flavoring across the back as well. As it warns, minor sulfur and cheesy grain evolves with a hint of fruity alcohol. This is a light bodied brew that is moderately carbonated. It is crisp, clean, easy drinking and overall just exceptionally done. Would drink again and really liked this considering the past couple pils I had were letdowns. A - about one finger of egg white head and a very hazy golden color. Nice looking beer. S - not a ton on the nose here. faint hop aroma, malts and some citrus accents as well. T - wow. very crisp and refreshing. small hop presence on the front of the palate, then some faint sweetness from the malts. finishes a bit tart but very clean. D - Highly sessionable beer. I could easily put back 2 or 3 of these on a warm day. Nice example of the style. This is my first experience with this brewery and hope to see some more of there offerings on tap in buffalo. Good stuff. Got a pint at my local Beer Nutz for 5 bucks. A - Pours a very bright clear yellow with tons of carbonation and a 1/2 inch of frothy white head. Nice. S - Bittering abrasive hops mix with pilsner malts and yeasts. T - At first it was very bittering with only a slight twang of biscuit malt to balance the finish but halfway through I really started to dig this dry hopped pilsner. Good and hoppy indeed. M - Light bodied and sharp with carbonation and mildly bittering hops. Overall worth a go if you like a light beer with a ton of great hop flavor. Mostly clear auburn pour with a thin layering of white head with some toasted edges. Thin layer of film retains while drinking, leaving a few spots of lacing behind. Intense grassy noble hops with spicy notes in the nose, way out of bounds for the style but incredibly exciting. Toasted malts and soft sweetness. More big time noble hops singing right up front, amplified with fresh cut grass and spicy bitterness. Pleasant malty backbone, toasted grains with minimal sweetness. Refreshing, crisp finish. Lighter medium body, decent carbonation, clean and dry on the tongue. Essentially a hopped-up pilsner, but this one was on point for me. This reminds me a little oh Humulus Lager, just not quite as amazing. I've had this on-tap a couple times over the years, so it's nice to see them throw this one in a bottle. 12oz bottle poured into a flute. Pours a transparent light golden, huge fluffy white head and leaves nice lacing. Looks great. The aromas are full of sweet malts, breads, crackers. There's a subtle touch of fruity hops in the aroma. This truly is a hoppy pilsener. This one will slap you in the face with its spiciness. More hop bitterness than hop flavors. Lots of black pepper in the mix. Earthy and robust. Extremely crisp and refreshing. Mouthfeel is crisp and has active carbonation. It's smooth and is very quaffable. Well crafted. So good. This might be my new go-to pilsener now that it's bottled. This one can give Prima Pils a run for its money. Slam dunk. Bravo.